Uniters has been manufacturing for many years with one main objective in mind, namely to create the conditions necessary for a balanced and harmonious relationship between people, the company and the environment. This policy is based on Uniters' determination to guarantee maximum satisfaction to all those parts of society for which the company is in any way responsible, including customers, partners, shareholders, society at large, the workforce, and of course, the environment itself. To achieve this balance, Uniters has developed an integrated Quality and Environmental Management System to enhance the value of all its resources, both organisational and human, and to respect the environment in which it operates. 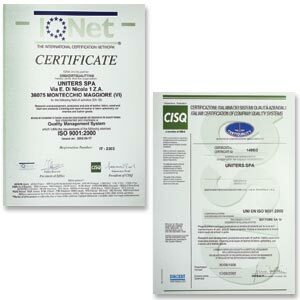 To achieve this, Uniters decided, back in 1998, to bring its organisation and its production and management processes into conformity with UNI EN ISO standards by respecting the strict rules and establishing the precise objectives necessary to reach the highest standards of quality in company processes and environmental protection. The first step towards ISO certification was made in 1998, when Uniters was awarded quality certification to UNI EN ISO 9002 standard. Then, in 2002, following the introduction of the new UNI EN ISO 9001:2000 (Vision 2000) standards, Uniters went on to achieve UNI EN ISO 9001 quality certification. 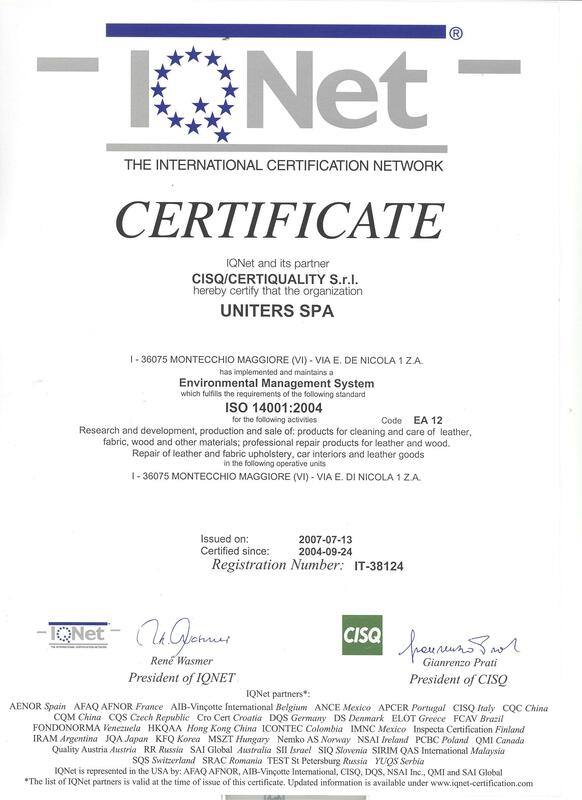 In 2004, as part of a process of optimising its environmental protection activities, UNITERS obtained UNI EN ISO 14001 environmental certification, developing its own Environmental Management System according to UNI EN ISO 14001:1996 standard. In December 2005, UNITERS obtained certification to OHSAS 18001, the standard on health and safety in the workplace. OHSAS 18001 is entirely compatible with ISO 9001 and ISO 14001 standards. Accordingly, UNITERS has been able to design and implement a system of Quality-Environment-and-Safety management integrated with its corporate governance system, such as will guarantee its customers safe and dependable products and a professional, efficient service, while assuring care for the environment and for the health and safety of employees, colleagues, visitors and suppliers. By virtue of acquiring this certification, Uniters qualifies for membership of the “Excellence Club” known as Certiquality, an achievement of which few Italian companies can boast. On 22 May, Certiquality presented Uniters with the Certificate of Excellence, an official document given by the agency to companies that have obtained the three certifications in respect of Quality, Environment and Safety. The certificate bears witness to the level of excellence achieved by Uniters though its systems for rationalizing and optimizing Quality, Environmental and Safety procedures. Click below to see and download the certificates in pdf format.